It’s Thanksgiving weekend when I call King Khan, and when he picks up he’s making a dinner of butter chicken and dal for his friends in Memphis. They’re all going down to Jay Reatard’s grave before it gets dark to pay their respects. 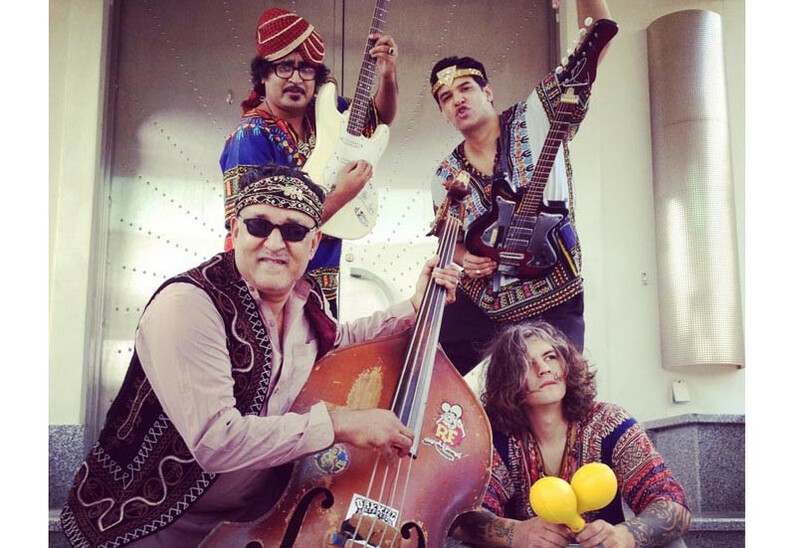 This fall’s Tandoori tour has brought Khan—real name Arish Khan—and his quartet up and down the East Coast, starting with a show in New York opening for ‘60s garage legends The Sonics, and down to New Orleans where he caught up with his friends Quintron and Miss Pussycat. The Tandoori Knights are Khan and Bloodshot Bill, friends since their childhood in Montreal. When the two are together, that juvenile side comes back in full force—perfect breeding ground for their Indo-rockabilly punk. With the help of an upright bassist and drummer, the Knights have been banging out their signature recipes, spiced up with sounds from the East mixed into their respective roots of garage and psychobilly. “I just got this compilation called Bollywood Steel Guitar on this great label Sublime Frequencies, and it kind of changed my life, just to hear the way you could use the lap steel guitar not just in a country way, but into a crazy Indian Bollywood dancing way,” said Khan. They’ve brought their Tandoori-seared rock through the States, and the sounds are being gobbled up, tender off the bone. In territory that typically belongs to die-hard country fans, Khan & company are showing folks a whole new side of the steel strings. Since Khan’s days in the late ‘90s with Montreal wild party machine The Spaceshits, he’s been conjuring the souls of Bo Diddley, Chuck Berry and Little Richard, mixing punk, psychedelia and doo-wop sounds to build a powder-keg of rock ‘n’ roll mania. But Khan wanted to do more, and this desire was embodied in his frenetic onstage energy and off-the-wall wardrobe. He’s built a persona that extends far beyond the everyday 30-something family man that he is. His legacy as King Khan is something truly deserving of a royal title. By now, it has an almost mythic quality to it. “[Afrofuturist jazz composer] Sun Ra was a huge awakening for me, when I saw how he created myths, and made them reality,” he said. Sun Ra’s cosmic philosophy and sheer creative power inspired Khan to reach even deeper into his art. Everyone Khan works with is part of one big extended family, their projects fueled by the desire to create music together. The party-punk performer sees it like cooking. “When I was younger my mom refused to teach me how to cook until I got married, I guess so I wouldn’t use it as an aphrodisiac thing,” laughed Khan. After the tour-ending hometown show on Wednesday, Khan heads back to Berlin, the city he’s called home since moving there after a Spaceshits tour. Long stretches of gigs are rarer now for the frontman, whose rocking out is now balanced against the realities of his wife and two daughters at home in Berlin. When back in Germany he’ll be putting the final touches on a new record with supreme soul-rockers The Shrines, a record that’s been three years in the making. Whether in a full-sized band complete with horns and cheerleader, or as a duo playing drums with their feet, every project Khan embarks on is strictly for the love of it. He’s a vanguard of genuine music, scantily clad and always ready for a food fight. One of the more serious moments of the conversation is interrupted by something that succinctly proves his point about not stressing too much. Khan is a man who’s clearly thankful for everything he’s earned so far, and has no plans to slow down. He’s always got several projects on the go, and you can be sure the King is enjoying every minute of it. Even the typically somber act of paying respects to a dear departed friend takes on a kind of strange, manic possibility.